It’s all change at Bogmoor Castle for the second series of CBBC’s spooky sitcom. 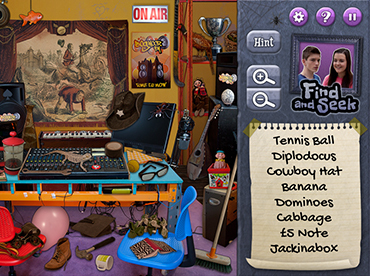 To herald the new faces and adventures, we created a hidden object game for CBBC that can be played on a variety of mobile and tablet devices as well as a desktop computer. Hidden Treasures features three object-laden locations that can each be searched in three different modes of play (Find & Seek, Against the Clock and Spot the Difference). 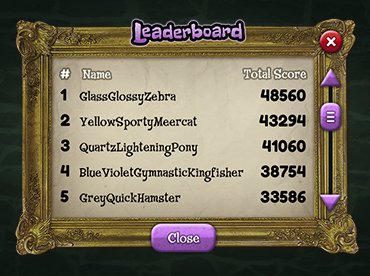 The game also features original photo-comic strip narrative ‘The Curse of Bogmoor Castle’ for players to unlock and collect as they progress through the game. Working closely with the CBBC Interactive team and producers of Dani’s Castle at The Foundation, our team collaborated to re-create the world of the show in visuals and storytelling. This included our lead developer and designer heading to the live set at Killyleagh Castle (the real Bogmoor) in County Down, Northern Ireland to gain source images of the locations, objects and stars of the show to feature in the game. The team generated a myriad of colourful objects artfully hidden in plain sight, created an entertaining story and ensured that the whole project worked on a plethora of platforms ready for the series’ broadcast. Whether at home or on the move, audiences can scour the kitchen for a solider or search the library for a gecko to join the fun at Dani’s Castle wherever they are.